We wanted to test our router in a real world application so we connected the Netgear WNDR3700v4 to a PC running Windows 7 64-bit and configured it using “Automatic” settings for both 2.4Ghz and 5Ghz bands. We took our Alienware M17XR4 to use as a target laptop client. The Alienware M17XR4 features an Intel i7-3610QM CPU with 6GB RAM running Windows 7 64-Bit, and an NVIDIA GeForce GTX 660M. More importantly for our tests, it is outfitted with a Qualcomm Antheros Killer Wireless-N 1103 Network Adapter. 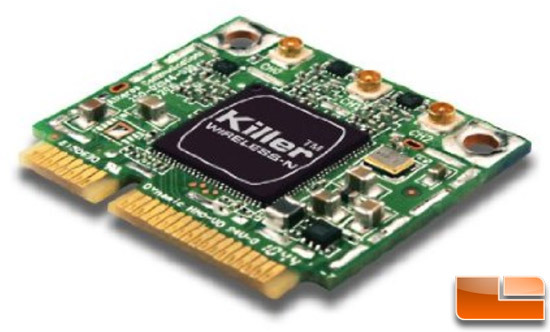 The Killer 1103 is a three-antenna network adapter that connects at up to 450Mbps over 802.11n and features reduced power consumption and Wi-Fi Direct. Much has been written about the Killer NIC technology in recent years but there is no doubt that this 3-antenna solution will give us the best possible wireless throughput for our test. We took our Alienware laptop and moved it 25-feet away from the Netgear router. We didn’t tell the client anything more than the SSID name for each router tested and let it automatically choose the channel to connect to. All the routers were set to “Unsecure Mode” (for fastest data throughput), and with WMM / QoS turned ON. 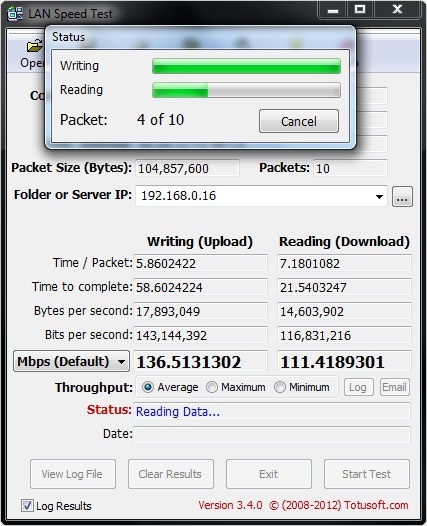 After connecting, we ran the PC application LAN Speed Test (LST) to measure file transfer and network speeds. LST builds a file in memory and then transfers the packet without the effects of windows file caching. It then reports the time and calculates the network speed. We repeated the test 2 more times rotating the router 90 degrees after each test to make sure that the router’s speed was affected adversely by its orientation. Benchmark Results: We were pretty shocked to see just how fast the Netgear WNDR3700v4 was when compared to its older brother. The speed differences were staggering in that we saw a 130% increase in average read speeds, and a solid 67% increase in average write speeds. 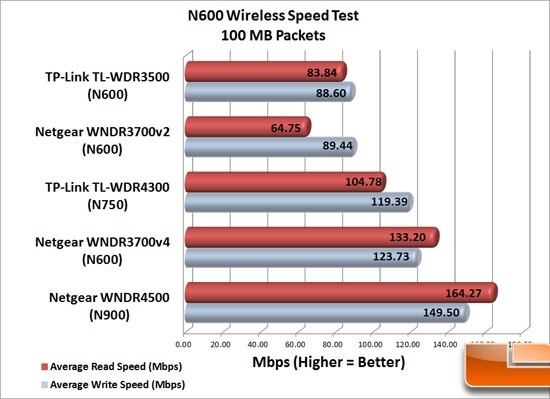 Because the change was so significant, we included recent tests of a N750 router (TP-Link TL-WDR4300) and N900 router (WNDR4500). 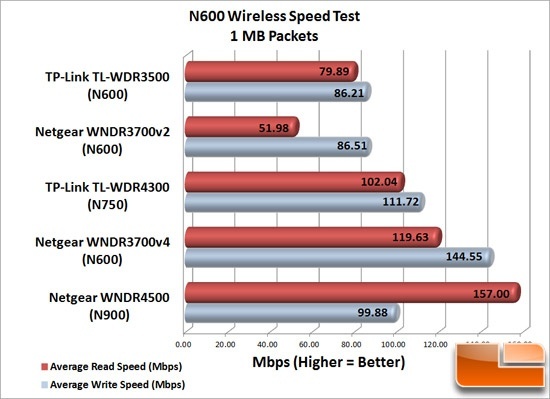 The Netgear WNDR3700v4 N600 router shows great speed outpacing the N750 router while coming up just shy against the N900. We can really see how the upgrade in processor is really makes a dramatic difference. Benchmark Results: Here we look at data packets that are 100 MB in size simulating data that you would normally see while streaming multimedia. The Netgear WNDR3700v4 really takes off here and shows off its speeds. It doubles the speed of the Netgear’s second N600 version (WNDR3700v2) with a 107% increase in average read speeds and a 38% increase in average write times. For those interested in upgrading their router so you can stream high-definition videos, this router will not leave you disappointed.